Collectors – Who are they? Go to any public library and stroll down the aisle where the psychology books are at. You will see book after book about the psychology of collecting. Google “Psychology of Collecting” and again, you will find post after post and informative articles of many educated and learned men and women discussing the psychology of collectors. Over kill probably is appropriate for all the drivel about why a collector collects. Psycho-babble! Sigmund Freud was an avid collector of Egyptian artifacts. It seems to me that everyone is a collector of something. Young people today, such as my grown children might say “I don’t collect anything”. Really. What about your FaceBook account. What are you doing on FaceBook? Collecting! Your collecting friends and the goal it seems is, the more friends you have on FaceBook the better and bigger your collection. The bigger the collection, the more time and effort it takes to clean it up, dust it off and figure out just where are you going with your collection. So it is with all of us as we accumulate more and more to add to our collections. Collecting in my own opinion has more to do with our own idea of what collecting means to each of us and the why just isn’t really that important. That being said, if you are a pathological collector and do evil things to get more for your collection. You, have a problem! I believe for myself it is best to explain my own path to collecting and how I have arrived at this point in my life with such a large accumulation of….things. One of my favorite stories about collecting is of the family, husband, wife and three young children who lived in Ohio. The couple were actually born and raised in Michigan but moved to Ohio for his job. On long weekends they liked to pack up the kids in the minivan and head out across country. You know, kind of do the gypsy thing. Mom liked to browse antique stores but Dad wasn’t really interested…until Mom bought him a nice little sterling silver collector’s spoon from Michigan. Dad decided he would collect these ornate and interesting little spoons so they didn’t pass antique stores any more. Now, they stopped at every antique store they saw. Soon, even the kids got involved collecting commemorative spoons from Michigan and over the years the collection grew and grew. To me the moral of this story is that Mom and Dad was able to pass on to their children the roots of where they were from and the history of their own lives from a young age. Also, I find this story pleasing because Mom and Dad were involved and with their children teaching them the virtues of collecting and saving. The children will always have stories about that “great find” to pass on to their own children and so it goes. My own story is much the same. My Mother was a collector from a very young age and collected antiques. First, antique dolls but later many other antique things. Eventually after following my mother to farm sales, garage sales and the like my Father also became a collector. He collected old wood working tools. (woodworking being his hobby). When my parents retired they built a beautiful and large log cabin home in the country and all of their collections found a home. One whole room was dedicated to my Mother’s doll collection and in the basement my father built a beautiful bar with all of his German antique beer stein collection displayed not to mention my father had a four car garage separate from the cabin to house his tool collection and a very modern woodworking shop. He actually built the garage first and then he built the log cabin home. It took them three years to build the home of their dreams but it was clear from the beginning they wanted to display their collections. Because my parents were collectors and often took my brother and I to different sales with them (an all day affair normally) I also became interested in collecting. I started with collecting antique items for my bedroom. As a teenager my bedroom furniture was all Victorian antiques including an oriental rug for the wood floor after all my parents were avid antique collectors. My brother collected music albums. Beatles, Dave Clark Five, Rolling Stones etc. He still has those albums today as well as an extensive Indian Artifacts Collection. We were raised on a farm in the Midwest and when plowing or planting we would often turn up arrowheads and the like which fascinated my brother and he just started accumulating. So I am from a family of collectors. In an article written by Jack Lowenstein he writes that people collect for three reasons. 1) nostalgia 2) the compulsion to accumulate 3) the desire to amass negotiable wealth. I agree with all of that. I enjoy the history, beauty and workmanship of those things created by our ancestors. I like the game and excitement of finding, buying, trading and selling to accumulate an enviable collection and I always keep in mind the resale value of pieces I collect and how much I have invested in my collections. More than a hobby I have turned my joy of collecting into a business interest. I am also continuing the traditions of my own family and upbringing. My own children seem truly amazed of antiques I purchased over 35 years ago that I still have and that some things I collected were not antiques when I bought them but now they truly are 100 years old. Collecting and saving. Synonymous. This is the true joy of collecting. What collections do I have? Asian Antiques, glass paper weights, antique beer steins, sterling silver commemorative spoons, Victorian furniture, Frankoma political coffee mugs and yes all of the above listed items are true collections. Not just odds and ends. I have odds and ends as well such as Heisy glass, old games, old books, and civil war relics to name a few but I never built a collection of those items. Am I a packrat? I don’t think so. I have organized collections, well cared for and I continue to buy, build, trade and sell within my collections. The nature of my blog and newly formed business interest on eBay. Be sure to click on my Assistant Editor to visit my eBay store “Kelekchens”. My goal now that I have started blogging is to build my own website and to continue to improve my ecommerce skills and of course improve my collections. 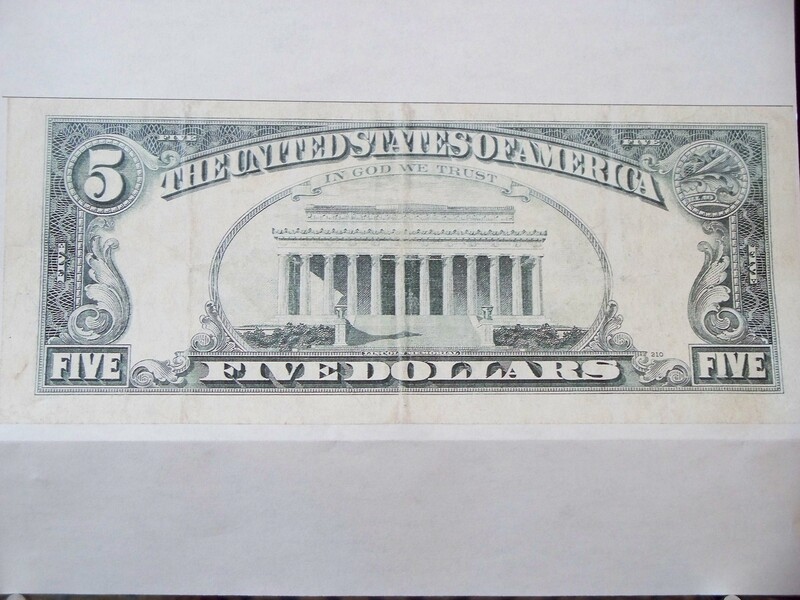 This is a 1993, $5.00, Federal Reserve Note printed at Atlanta, circulated. 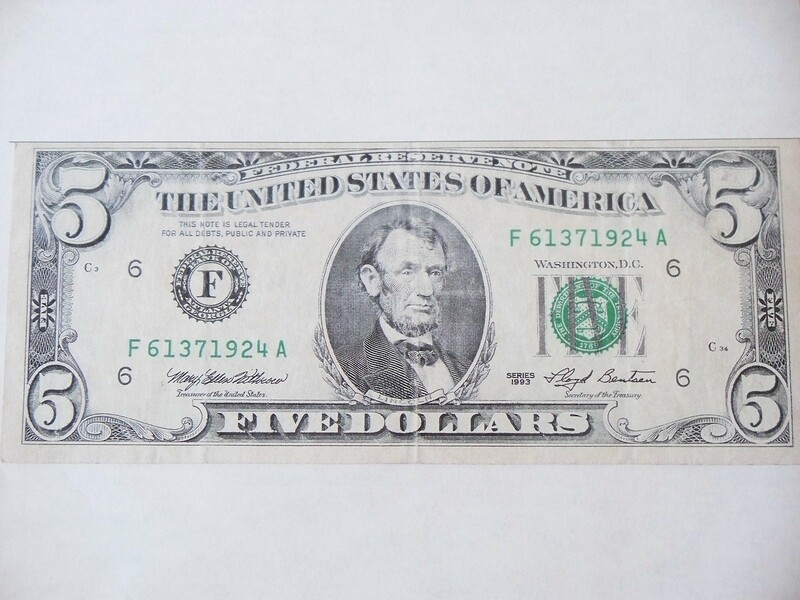 Notice anything different about this note? Missing the 5 on the back, upper right hand corner. This is known as an “error note”. 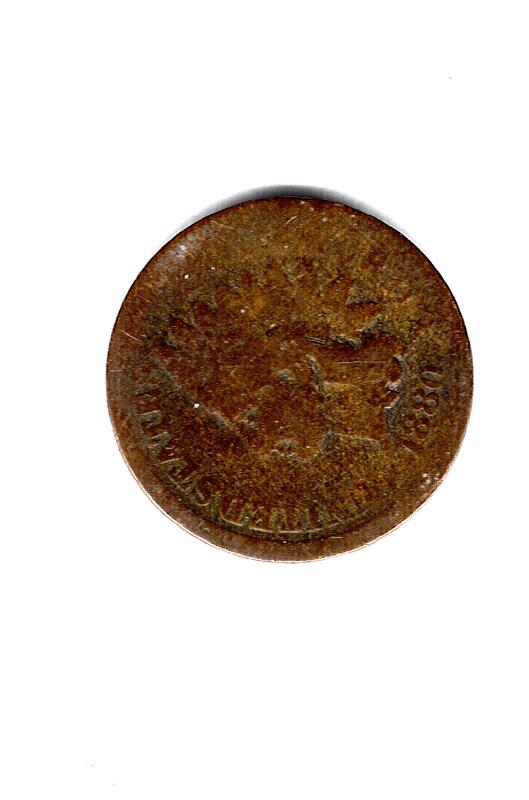 This is an 1880 Indian Head Cent. Another lucky find. So watch your money. It may be worth more than its intrinsic value. That is all for today fellow collectors so until next post Happy Collecting and remember the best is yet to come.